My Opinion: 6.7 || Gritty crime drama that’s more realistic than revealing. The film strives to deliver real meaning and has the right ingredients, but the crowded, overbearing production never gives the story room to breathe. SYNOPSIS (Courtesy of Netflix): In Rio de Janeiro, some cops are just as crooked as the drug lords who run the slums. On the brink of retirement — and burnout — Capitão Nascimento must find a trustworthy successor to lead a dangerous mission in this gritty action-thriller. 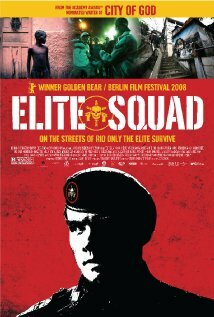 Strengths & Weaknesses: I’ve been excited for Elite Squad ever since watching José Padilha’s documentary Bus 174 on the third day of this project. That film’s gripping look at crime and the plight of the dispossessed in Rio de Janeiro made it one of the most probing and effective documentaries I’ve seen. Elite Squad covers much of the same territory but adopts less interesting angles and never attains the same dramatic tension. The movie often feels like a feature-length Brazilian version of The Shield, which is not a bad thing. But we never get the humor and clever plotting that enlivened The Shield’s otherwise bleak view of law enforcement and human nature. Nevertheless, the film’s verisimilitude is outstanding – one kinetic scene after another pounds home the day-to-day realities of Rio’s slums and police. And by no means is it empty-headed: Padilha has important things to say about the ways in which neglect and corruption metastasize. Unfortunately, he chooses to say those things in a supremely unartful way: by having Captain Nascimento explain every damn scene. There’s hardly a moment or development that doesn’t get some pedantic explanation. It’s quite an irony that Padilha’s documentary contains zero narration, while his fictional action-drama just about drowns in it. Granted, I tend to have a bee in my bonnet about extraneous narration (for instance, here, here, and here). But this is more egregious than most — not only because it smothers the movie in frequently uninteresting talk, but because it leads the film to explain ideas instead of dramatizing them. Padilha depicts violence and corruption with clarity, but he doesn’t ask interesting questions or explore the real tragedy of what he’s showing. What we wind up with is an over-written film that says a lot but reveals not as much as it should. Characters/Performances: The young, orphaned street thug who takes people hostage in Bus 174 is a figure of great pathos – a character worthy of a good novel – whereas Elite Squad’s protagonist never becomes a compelling character. Unless this happens to be your very first drama involving police, you’ll immediately recognize Captain Nascimento: He’s aggressive and tightly wound, he hates the job but can’t turn his back on it, and of course his pretty wife can’t take it anymore. Many of the film’s secondary characters are well drawn, particularly the rookie cop Matias (even if his character, like everything else, is over-explained). The actors are all disserved, though, by the film’s monochromatic emotional palette, and no one surprises you very much.